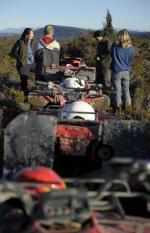 New Zealand has long been a popular travel destination, especially for women adventure seekers. Many come to the country to see the diverse wildlife, explore cities like Auckland and Wellington, enjoy outdoor recreation and tour the scenic destinations on both the North and South Islands. Others come to see the land of Lord of the Rings with their own eyes. There are some women travellers, however, who want to take outdoor recreation beyond basic hiking and site-seeing trips. For serious thrill seekers, New Zealand has it all. Some of the most popular options include exploring caves, driving off road in rugged terrain, rafting, bungee jumping and even skydiving. Since most of these activities can often be found in remote areas rather than within the major cities, hiring a car is the ultimate way to get around. You won’t have to deal with long bus rides, and you can choose to set your own schedule to fit in as many adventures as possible. Read on for the most extreme adventures that you can enjoy while visiting New Zealand. There are several incredible places to try caving in New Zealand, but the best is widely considered to be the Waitomo Caves. The name of the caves comes from the Maori words for water (“wai”), and hole (“tomo”). If you just want to explore the caves without anything too adventurous, you can take a walking tour for two hours that comes in at $67 per person. For a real rush of adrenaline, kick it up a notch and enjoy the four-hour Lost World Tour. 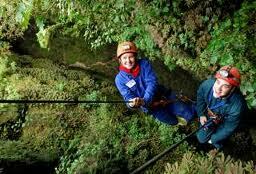 This adventure includes abseiling into the cavern then trekking through the misty caverns. The price for this adventurous tour is $310 per person, and you’ll want to wear your grubbiest and most comfortable clothes for the journey. If you have a taste of adventure and love outdoor recreation, you’ll probably spend plenty of time driving around in New Zealand. If travelling up and down the paved roads of North Island isn’t enough to get your blood pumping, consider an off road driving adventure instead. Since rental cars are often not insured in the most treacherous locations in the country, your best bet is to book a tour with quad bikes. For fans of the “Lord of the Rings” films, you can combine the best of both worlds with a quad bike tour in Lake Te Anau Middle Fiord, a location where parts of the films were shot. Expect to pay $155 for a four-hour adventure, and enjoy a few light snacks and drinks along the way. New Zealand is home to rapids that range from Level 1, which is basic and suitable for beginners, all the way up to Level 5, which is meant only for incredibly experienced rafters. Along Mohaka River in Hawke’s Bay, rapids are between levels two and five to suit most participants. If you are looking for a thrill but nothing too crazy, join the all-day tour called the Whitewater Plunge. For $125 NZD, you will get a minimum of four hours in the water, the chance to go swimming and even cliff diving opportunities. You’ll need to dress to get wet, and be sure to bring along a towel and a lunch. Staff will give you a container to keep everything dry along the way. Most of the adventure activities in New Zealand take place in rural areas, but one of the most thrilling bungee jumps in the world happens to be off the Auckland Harbour Bridge. For $150, you will get the experience of a lifetime and a certificate to prove you made the jump. Keep in mind that you have to wear shoes on the jump, so bring along a pair of sneakers that fit tightly and won’t fall off. Of all the adventure activities, skydiving is the most impressive. The bottom line is that jumping out of a plane takes a lot of guts, even if you happen to have a parachute or you are strapped to the back of a trained jumper. Dropping for more than five minutes and covering over 15,000 feet, you’ll have plenty of time to both scare the pants off of yourself and settle in for the ride! If touring cities on foot and going on a cycling tour just isn’t a big enough adventure for you, then consider one or all of these extreme adventures in New Zealand. Nice post to share rosemary . This is a useful content.. I love going to adventure trips with my girl gang. WE often travel to some wild locations to explore the nature. We are travel lovers. I loved reading your blog. I will definitely plan a trip soon to New Zealand.